Performing the Bee Gees classic I've Gotta Get A Message To You with serving Army men The Soldiers, the singer-songwriter could beat Cliff Richard's five-decade record next month. The single will be released on October 23 before the Royal British Legion's annual fundraising drive, which starts on October 27. It will be the first time serving soldiers have performed on the official single for the appeal, which will focus this year on the recovery of injured Armed Forces personnel. The Bee Gees lead singer said: "Although not written all those years back about soldiers, it can represent the human emotions of servicemen - or in this case, a single soldier. "It's about being trapped in a corner far from home, brave but scared and thinking of loved ones." The Soldiers - Sergeant Major Gary Chilton, Staff Sergeant Richie Maddocks and former X-Factor contestant Lance Corporal Ryan Idzi - were "over the moon" when the Staying Alive singer agreed to record with them, the Legion said. Disco star Robin said: "These men deserve our respect and we need to remind ourselves that they - including of course Ryan, Gary and Richie - are prepared to lay down their lives for our freedoms." 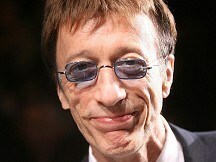 Robin Gibb wrote the song with his brothers Barry and Maurice, and it was originally recorded by the Bee Gees in 1968, becoming their second number one single on the UK singles chart.